the new pump didn't change anything. I primed the lines before I installed the pump. I filled the float bowls and it fired and ran until the bowls were empty. I'm getting annoyed. my plan for today is to pull the fuel pump outlet and hook my mityvac up and see if I can get some fuel pulled through it while shakes cranks it. this is stupid. switch to an in line electric pump and be done with it. Found a post from 2007 showing how well Mopar's electric fan CBG4F250 fit the original shroud. I ordered one and it fits and looks great! Really appreciate 67-72chevytrucks.com!!! have you checked the carb to ensure the inlets are able to accept fuel? if the carb is empty of fuel you should be able to blow into it with a short piece of hose and some full cheeks. if you come up against a "no blow" maybe you simply have stuck inlet needles or plugged inlet porting in the carb. since you have checked everything else that seems a possibility. also, have you done a pressure/flow test of the pump by disconnecting the line at the carb (that makes sure you are getting fuel right up to the carb, eliminating everything else up to that point) extending the line with some flexible fuel hose and finally dumping the outlet into a container safely away from the engine? that will tell you if the pump works, if the fuel system up to the pump is free flowing enough and what you are actually getting for fuel delivery GPM and pressure. just a thought but maybe worthwhile to test since it would only take a minute. was the carb new new or new to you? (wondering if the carb has ever actuallly accepted fuel before and if there may be an inlet porting issue internally in the carb so you have no way to deliver fuel to the bowls. thats wht the blow test with some hose and a gulp of air from your cheeks). Got my five minutes in tonight. Fine tuning the door gap, I have hated this factory seam that had the 1/4" of lead filling it so I made a patch for it. MartinSR glad to see you're sticking to your 5 minutes. I have continued to adopt what I call "5 minutes for everything" this year. It has served me well. 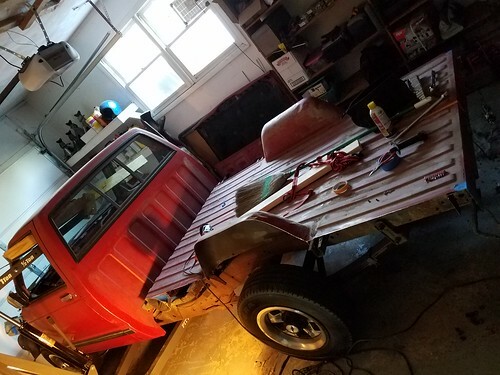 The 5 minutes last night was put into cutting out the floor of my S10 donor truck bed in the hopes I can put a steel floor under the 3100. It gets stuff done that's for sure. One step forward, two back. Went to install my sun visors. Found that bracket is slightly different and they are too long (should have trial measured). I think I must have grabbed a later model from a 62 donor truck I had years ago and used that as the template. New correct brackets are on the way and good news I am shortening what I have not needing to completely rebuild. Did get the shift boot, seat frame and upholstery, mirror and lower windshield trim in. Need to get the back window in, final assembly on the steering wheel, seats in and interior is buttoned up. Will post pics when done. I got out there for a little being I HAD to watch the Warriors tonight. Anyway, got the gutter shaped pretty good. I heated it with the torch and bend it, it works so much better than cutting something sometimes. I learned this out of the blue many years ago chopping a VW bug on the A pillars. It worked out so damn smooth, I used it on the truck A pillars too. But it really works good on so many things. 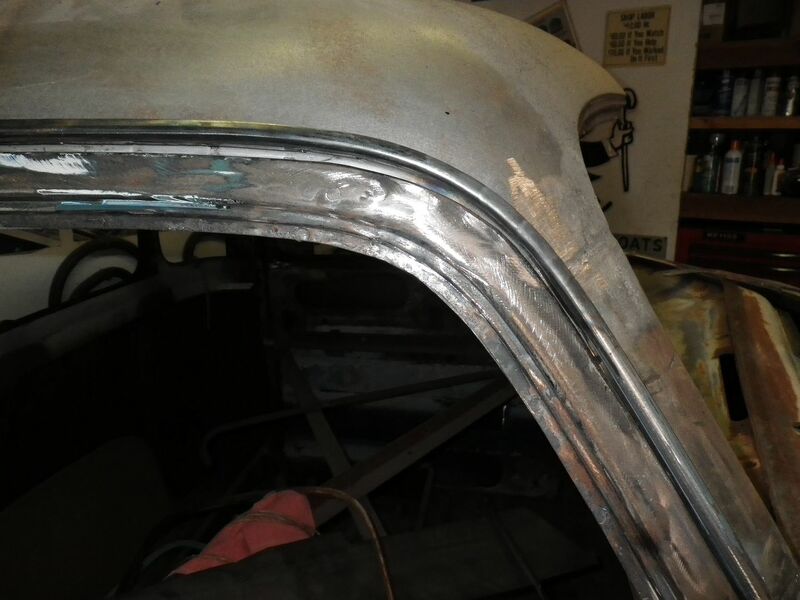 I did things a little faster back then, that VW bug, I had it chopped, start to finish, I am talking in primer, DONE, in one day, about 10 hours. Getting ready for the weekend. Been hacking and cutting the past couple of weeks to get the bed off. Sure hope I measured it right. I made myself a little jig out of 2x4 to get the 50" width all the way along the bed. This was from yesterday, forgot to post it. I wasn't going to spend so much time, but you know how that goes! If it didn't happen it would take a hell of a lot longer at 5 minutes a day. I got the gutter off, welded the longer piece on, trimmed it off nice, ground little here and there so it would fit better, oh yeah baby, looking good! And by the way, in this photo it looks like the door top sags in the middle, it doesn't, it's an illusion because of the different colors, cross my fingers, honest. So that was yesterday, today, got out there for five or ten minutes I got some welding done on the seam I cut on the cowl and the patch panel. 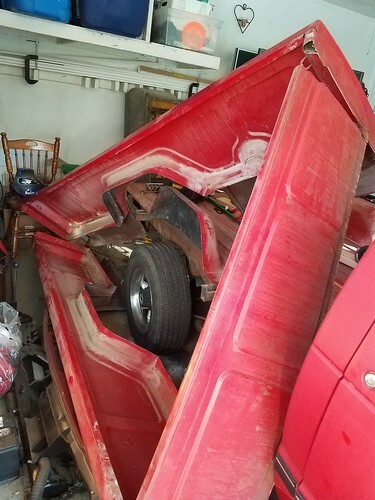 I also got a little plan on modifying my cab cart to raise the cab up so the floor can be sand blasted top and bottom and the firewall inside and out. That's something I will need to do as soon as the welding is done. Damn, good idea. Wishing I would have kept my s10 bed now. 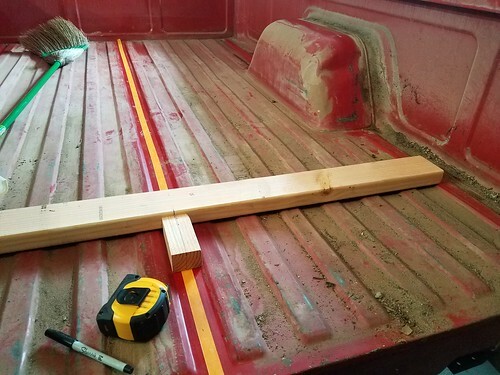 Went on a trip to Montana in Judith gap to do relaxing and to pick my new/old wood for the bed of my truck I really like the color it dry and love the grey weather look. I wanted to keep the wood looking old and original so I did some picking on an old house that fell down. The fun thing is the truck came from this town got to meet the original owners son and he gave me the history on the truck and I was trying to find the deal plate but he didn't have one but he gave me some stickers. Stay tune to how the bed comes out. Finally got courage up to rip out the bed. I still remember installing it back in 1995 and the "marine grade plywood" touted to last forever was long rotted away. I had sealed it, painted it and did it all so it lasted maybe 15 years before giving up. New bed will be Choicedek synthetic with all stainless runners, angle covers and all stainless hardware. This one better last as its the last one i will install. What a mess. Had to grind most of the rusted bolts and tear out the runners with a crowbar. This is an awesome idea! I want to copy it. Post pics when you start installing it. Drove my truck I just got back 2 weeks ago, 3rd time owning it, last time now. Neat idea. There is a barn I pass behind my neighborhood that is super rundown. Just waiting for it to collapse so I can ask them for some of the wood. Hopefully there are a few good bits; I would totally use it for a truck bed. I had such a great surprise and a great time with my friend Tom and his daughter Michelle and her awesome son Anthony when they stopped by tonight. Tom sold me his 1948 Chevy pickup when I was just 15 years old for $200 paper route money. I didn't even have a license driving it home with a permit with I believe my mom riding shotgun. The photo of the truck with the flat bed was that day, the first day I had it in Dec 74. We were out in the garage with the cab from my truck chatting about old times, it was such a good time, such a treasure. I learned a few things and it was just a blast. The photo with me holding the very velocity stack that was on the truck in that first photo in my driveway! I don't mind saying I was a little verclimpt after he left, he is in such bad shape with parkinson's disease, damn it. Such a special man, they don't get any better than Tom, damn it! After he left I HAD to get in my five minutes and I cut the rusted area out of the drivers side cowl. I wish, I wish so bad I could get that truck done to give him a ride. But even if I was to go nuts on it I seriously doubt I could get it running in time to where he would still be able to get in it. All I did was sell my 58, health issues forced the sale. Sorry to see it go but it went to a good home and it will get built for sure. Thanks, he is a good guy darn it. Hopefully you be able to see it with the new owner driving it with a smile on his face. That's always nice that it goes to a good home. 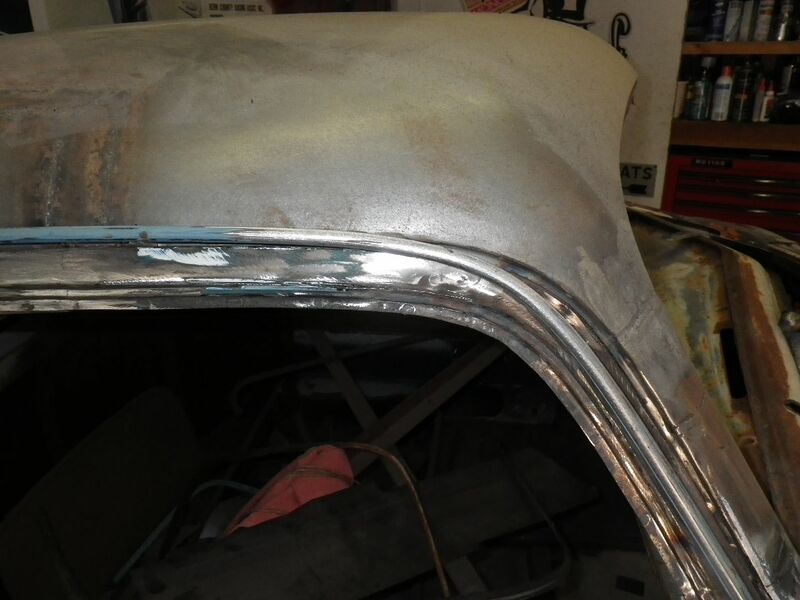 I got the bottom outer panel rust cut off on the drivers side cowl, and then I "drove" it out of the garage onto the lawn to sand blast the inner structure of course finding much more rust. It is localized so not a big thing, just a few more "five minute" stints. I had a conversation with my truck this weekend I told my truck that its close to being back on the road and that I would start working on it again by next weekend. I wrote out a game plan on my white board and will get to it soon. Been installing the interior small stuff, details in the build thread.